Nobody else in the Minor Leagues is clobbering baseballs like Rhett Wiseman right now. 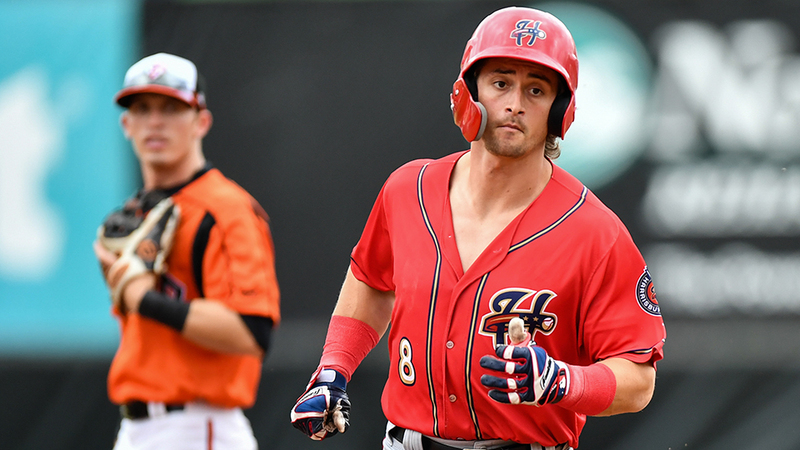 The Washington outfield prospect launched two solo jacks in Double-A Harrisburg's 4-2 win over Altoona on Monday at Peoples Natural Gas Field, bringing his season home run count to a Minor League-leading eight. The two-dinger performance gave him four homers in as many games and came hours after he was named the season's first Eastern League Player of the Week. Wiseman posted a .424 average with six long balls, three doubles, 13 RBIs, seven runs and a 1.061 slugging percentage in his first 10 games for the Senators. "I'm trying not to get caught up in it," the 24-year-old said. "I'm trying to just take it one pitch at a time and stay within my approach and try to keep it even, keep it balanced. The last thing I want to do in this game is get too cocky or be overconfident, because that's when this game will bring you right back down to where you need to be." Wiseman flied out to left field in the first inning and popped to first in the fourth before starting to tee off. The left-handed hitter led off the sixth with an opposite-field homer off right-handed reliever Yeudy Garcia to tie the game, 2-2. Two innings later, Wiseman padded the Senators' lead with another roundtripper -- this time pulling an offering from righty Vicente Campos -- before popping out in foul territory in his final at-bat of the night. The second blast sailed down the right-field line and passed the roller coaster beyond the PNG Field fence. Wiseman watched for a second as the high-arching path nearly carried the ball foul. During the swing that sent the ball out of the yard, his back knee nearly glanced along the dirt. That motion was rooted in a conversation from Spring Training 2018, when Wiseman and Nationals Minor League hitting coordinator Troy Gingrich discussed the mechanics that led to the Vanderbilt product hitting 13 home runs each of the previous two seasons. They didn't want to change everything, but Gingrich encouraged Wiseman to use more of his lower half and focus on hitting the ball to all fields. That night, the Boston native went home and hunkered down at his computer for four hours. He pulled up videos of a future Hall of Famer who provided the perfect example of what Gingrich wanted to see from Wiseman. That player ended his 21-year career with 3,166 hits and 477 home runs, and his highlight reel at the plate had a lot of swings ending on one knee, just like Wiseman's did Monday. "I've watched more videos of Adrian Beltre hitting line drives and home runs than maybe anybody," he said. "Maybe even more than Adrian Beltre." Wiseman repeated 2018 with Class A Advanced Potomac, and the adjustments showed in his third at-bat of the season. In the seventh inning of Potomac's opener on a cold night, he knocked a mid-90s high fastball out of the yard. It was the type of pitch Wiseman had struggled with ever since the Nationals took him in the third round of the 2015 Draft. By the end of the year, he'd amassed a career-high 21 dingers. "I didn't think it was possible," he said. "I totally credit that to the work that Troy and I did in Spring Training in 2018. … As long as I can think about staying in my legs, I'm able to get balls at the top of the zone, at the bottom of the zone, at the middle of the zone and just be more consistent in my approach." The changes led to a .461 slugging percentage last season. That figure has more than doubled early this year to 1.061, with 11 extra-base hits through 11 games. Wiseman doesn't care, because he finds he's most successful setting team goals -- like winning an Eastern League championship -- than he is chasing stats. Nights like Monday will help the Senators' quest for a title. Mario Sanchez (2-0) picked up the win after throwing four hitless innings to close the game. After walking the first batter he faced, 24-year-old righty reliever Jerrick Suiter retired 12 straight, seven by strikeout. Sanchez lowered his ERA to 1.80 in 10 innings this season. Campos (1-1) took the loss after entering in the eighth and allowing home runs to Wiseman and Drew Ward.